A mural celebrating a woman on the FBI’s most wanted list was quickly removed from the campus of Marquette University in Wisconsin following complaints. The Journal Sentinel reports that the mural of Assata Shakur was displayed in March at the Marquette Gender and Sexuality Resource Center. But university officials weren’t happy. 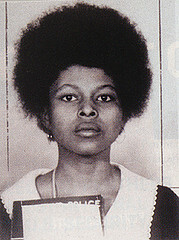 Shakur was convicted of killing a New Jersey state trooper in 1973 before fleeing to Cuba. Posted: 5/19/15 at 9:40 AM under News Story.